SEG Tension Fabric Frames are specifically designed to meet the demand for high volume retail roll-outs. Fabric Frames for Silicone Edge Graphics (SEG) are lighter in weight and are easier to install. Frame profiles can be assembled in just a few steps and are available in a range of profiles or custom designed to maximize the use of your space. 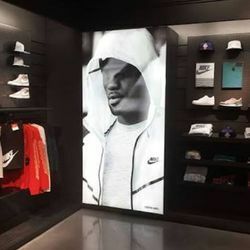 Fabric Light Box present many opportunities for impactful signage. All frames can be wall mounted, double-sided, free-standing with support feet, or ceiling suspended. Printed and fabricated in any size the options are literally endless. Silicone Edge Graphics or (SEG) is a tension fabric that is printed using a dye sublimation process and sewn around the edges with a thin silicone strip (or Gasket). The edges of the finished fabric are inserted into a recessed groove around the perimeter of the framing system. The result is an upscale frameless appearance, that displays a drum tight fabric graphic from edge to edge.